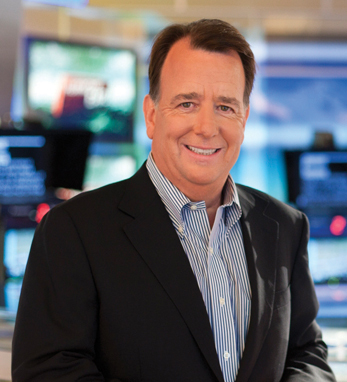 Michael J. Kelly is president and CEO of The Weather Channel Companies, the world’s largest weather-focused media and technology company, reaching over 160 million viewers. With nearly 30 years of experience in the media industry, Kelly most recently served as senior advisor to Veronis Suhler Stevenson, a $3 billion, media-focused private equity firm. He also served on the board of several fast-growing digital media companies – MediaMind (formerly Eyeblaster), Visible World and American Town Network – and as an advisor to the board of Contextweb. Previously, Kelly was president of AOL Media Networks from 2004-2007, where he was responsible for all of AOL’s advertising properties globally. Under his leadership, AOL was repositioned in the media and advertising marketplace and experienced significant advertising revenue growth. A Chicago native, whose great-uncle was the first Irish mayor of the city, Kelly is a graduate of the University of Illinois Urbana-Champaign. He began his media career in 1980 at the Chicago Tribune. In 1983 he began a 17-year run at Time Inc., first at Fortune magazine then as part of the launch team of Entertainment Weekly, eventually becoming EW’s publisher. Kelly was named Publisher of the Year twice during the four years he served in that role. Kelly currently serves as a board member of the Ad Council, The American Advertising Federation and is the Chairman of the AAF’s Advertising Hall Of Fame. A proud Irish American with roots in Mayo and Galway, Kelly has five sisters, one of whom is author and filmmaker Mary Pat Kelly.